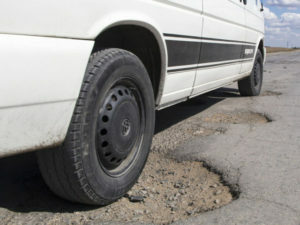 Potholes and congestion on local roads could be eased if the government gave the income from rising fuel and motoring taxes to councils. According to new analysis by the Local Government Association, more than £400m extra each year could be spent by councils on improving local roads if the government matched the increase in fuel and motoring tax income generated in the last 10 years. This would help them reduce congestion, improve air quality, contribute towards tackling the country’s £12 billion road repairs backlog and encourage residents to use alternative transport where possible. Although the LGA welcomed the government’s recent plans to share a proportion of the Roads Fund to support local roads, it added that a more ambitious strategy is needed to make sure our roads are equipped to handle the increase in vehicles and forecast increase in traffic by up to 55% by 2040. Cllr Martin Tett, LGA Transport spokesman, said: “The vast majority of journeys start or end on a local road – the impact of almost 30% more vehicles cannot be over-stated. Congestion, wear and tear of our roads, and air quality are all affected. “The government needs to develop a fully funded plan to help councils deliver the desperately-needed local road improvements we need. This should include matching the extra growth in tax take with the funding it provides councils.